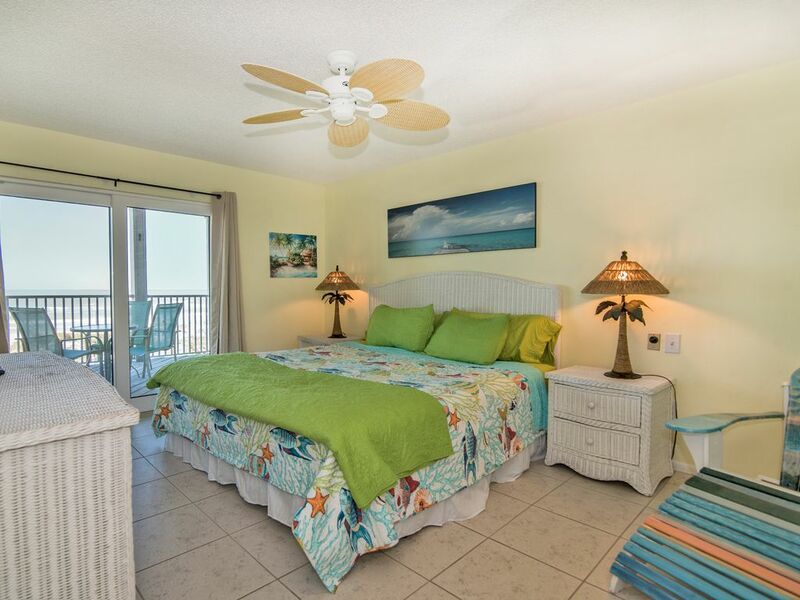 2 Bedroom, 2 Bath Gulf Front Condo Suite Right On The Beach! All the amenities for a relaxing beach retreat. Two Beautifully appointed balconies to admire the warm sunrises and sunsets. This 1200 Sq.Ft. Suite has two bedrooms (King & 2 Twins), two baths, complete with equipped kitchen and dining area for four. Relax by the pool, or dine on the balcony while you watch the boats and dolphin go by. Catch the trolley right out front and go explore the area. What are you waiting for? You deserve this! This is a beachfront property directly on the sand. You have two balconies to enjoy both the sunrise and sunset every day! There is also a balcony with seating to eat outside as well. Beach toys and a ping pong table. Beachfront pool on site for our guests only ! Location, Location, Location...Old Timers call this part of the island "The Narrows" where the sand is just wide enough for a single row of homes. Walking distance to local restaurants and pubs. Come and enjoy our little slice of paradise. Main entrance door is not good -- it's been banged up and doesn't really seal up with the door frame. Pool is good & really enjoyed the patios. We've stayed here a few times before but probably won't again unless we see updates online. I would pay more per day with the updates noted above. Thank you for taking the time to submit a review for Joyce's Suite 2. We appreciate hearing from our guests. As a return guest your opinion is highly valued. Glad to hear that you liked the washer/dryer, pool, and patio. It seems as though we need to get into that unit for some simple repairs, and perhaps convince the owners that it's time for new furniture. As our slower season approaches, we hope to do so. Thanks again for your suggestions! Would stay there again , the property has everything you could possibly want at the beach. There was nothing we needed to bring other than a beverage or two. Thank you for taking the time to review Joyce's Suite 2. We are so happy you enjoyed your stay, and we look forward to having you back again for your next beach getaway. This condo is located directly on the beach. It is so gorgeous looking out over the Gulf while sitting on the balcony. The pool was really nice for the kids and it felt private although both of the other units were occupied. The negative is that the inside of the condo was REALLY dated like it hadn’t been updated since the 80’s. The pocket door to the bathroom had to be shimmied to close it and the screen door came off a few time while trying to open it. Regardless, I found it comfortable and the space was HUGE! You need to rent a car to get around but there’s a lot to do in the area. Thank you for taking the time to review Joyce's Place Suite 2. We like hearing from our guests. Glad you liked the close proximity to the beach, pool, balcony, and privacy of the home. Sorry to hear you were disappointed with the decor. We' re working with the owners and gradually making improvements (especially during the slower summer season). These reviews help us to know what's most important to our guests. Thanks again, and please consider staying with us for your next beach getaway. We have many options for beach rentals. We stayed in unit #2 for five days over Christmas. The unit is right on the beach. You walk down a flight of stairs and you're on the beach. Hard to beat that. Thank you for taking the time to review Joyce's Beachfront Suite Two. We appreciate hearing from our guests. So glad you enjoyed the property...especially the location. We are in agreement, "Location is everything". We hope you will consider staying with us again, here at Joyce's, or any of our Beach properties. Nice location to everything and with only 3 units in the place it felt like we were the only ones there. We appreciate hearing from our guests and we want to thank you for taking the time to review the Joyce's Beachfront property. Glad you enjoyed your stay and the beachfront location. I like your point about being one of only 3 units in the home...it really is quite private. We hope you will come back and visit us again for your next beach getaway. Amazing view of the ocean and sunset! Such a quiet, peaceful setting. It was exactly what i wanted and needed. So happy I chose Joyce’s place. Would return in a heartbeat! We would love to have you back! Thank you for taking the time to review Joyce's Place. So glad to hear it was "Marvelous". It really is an ideal spot just steps from the Gulf water. Hope you'll join us again for your next beach getaway. This beach home is on the thinnest most beautiful section of Indian Shores FL. Waterfront views in all directions. Explore the beach communities, 10-minute ride on the beach trolley to John's Pass Village, a large marina, shopping and dining complex that offers a variety of water sports rentals, casino boats and dolphin-watching or sunset cruises. Ten minutes to the north, you'll find another marina and a variety of shops and restaurants at Clearwater Beach, also home to the Clearwater Aquarium, the residence of dolphin movie star Winter from Dolphin Tale. For a taste of city life, nearby downtown St. Petersburg, a 20-minute drive from the beach, is home to several world-class art museums, including the renowned Salvador Dali Museum, and popular attractions less than an hour's drive away include Busch Gardens, Adventure Island and the Florida Aquarium. For day trips, Orlando, Disney World and Sea World are a 90-minute drive and both the Tampa International Airport and the St. Petersburg-Clearwater Airport are within a 30-minute drive. Enjoy fresh local seafood at the award-winning Salt Rock Grill or casual eateries like Aqua and Guppy’s, watch the sun set over cocktails at The Pub or stop by the iconic Lighthouse Donuts for a quick snack, all just minutes from your vacation home.You can do as much or as little as you like at family-friendly Indian Shores, a serene beach town that offers spectacular white sand beaches and award-winning local restaurants. It's a perfect spot for romantic getaways, family vacations or a break from cold winter weather!